Not a bad morning after the bad night, took Bruno for a walk back to Shardlow and saw Digbeth again. 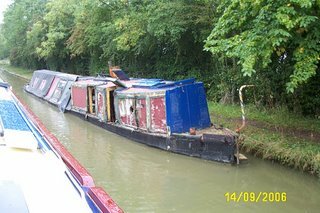 Gave them a shout, and arranged for a delivery of smokeless fuel as they passed our mooring. 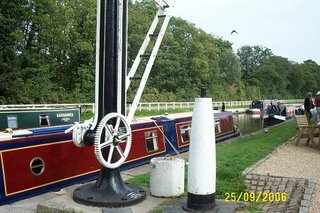 Caught up with them again at Sawley Locks, but we parted company just after when we swung into the Trent backwater for the services. We wanted to be full/empty when we arrived at Redhill for the cratch frame and cover to be fitted. Arrived at Redhill at 12:00. You can see on the above picture the top bend design I finally finished earlier this week. The geometric circles and diamonds are a traditional decoration on working boats. Left Willington around 09:40, and hit the tail of a queue of boats at Stenson Lock. Lots of Canaltime boats coming the other way, I guess from Sawley. 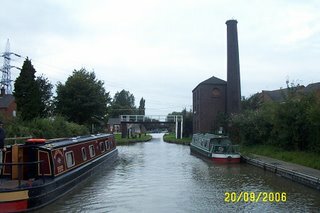 We shared the next 4 broad locks with NB Flimby, which made it easier to work them, and stopped for the night after going through Shardlow, just before Derwent Mouth Lock. Spotted NB Digbeth selling fuel in Shardlow. Bad night, thunderstorms and heavy showers meant that Bruno could not settle, so we couldn’t either. Woke up to a beautiful morning, went for a run and then took Bruno for a walk. Spotted these Red Admirals sunbathing and feeding on Ivy flowers. 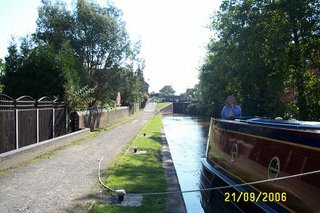 Easy run to Willington through 7 locks, arrived just as 2 boats were leaving so slotted in to a mooring in the centre of the village. A 12 mile run (ending in a thunderstorm) led to a restful day Sunday, tightened stern gland and cleaned bilge, polished some brass, bits and pieces like that. Left our mooring at Whittington at about 09:30, and had a 5 minutes wait at the junction of the Lichfield Canal where there are bridge works in progress, laying new railway lines. The first set of traffic lights we’ve seen for a while! After this, we had an uneventful cruise up to Fradley Junction, where we filled up with water and emptied the loo and rubbish. 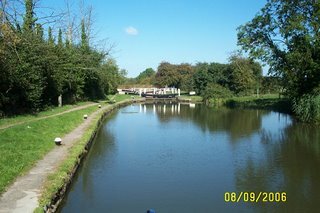 Up through Junction, Keepers, Hunts and Common Locks, and stopped for the day before Bagnall Lock, where we’ve stopped before. 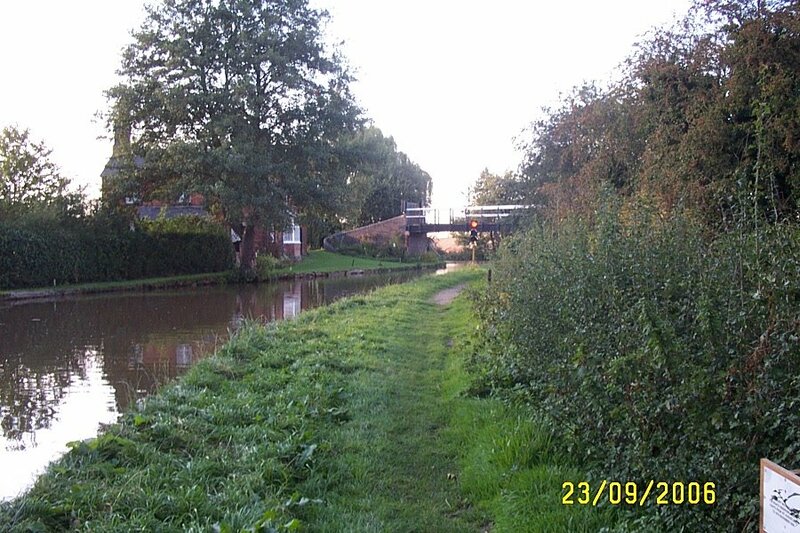 Went for a run first thing to Whittington, which was were we had planned to stop the previous night. 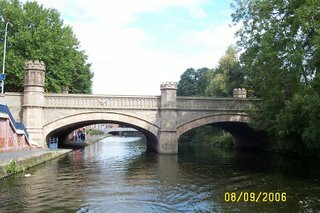 The moorings looked good, so we moved from Hopwas at about 10:30, and had a gentle 2 hour run to just past Bridge 80. Went shopping at the Co-op, and spent the afternoon "chilling". Lost the peg bag last night! Hung it on the door while we pegged out the washing, it was very blustery and it disappeared. Must have gone over the side, groped around with the boat hook to no avail, and kept a sharp lookout for the first mile or so, but no luck. So apologies in advance to anyone who has to disentangle a tartan bag filled with pegs from their prop between bridge 48 and 49. Overcast start to the day, with rain forecast for later. Into Tamworth and joined the queue for the Glascote locks. These, like Atherstone, are slow to fill and quick to empty, so take a while to pass. We were clear by about 13:00. Heading down to Fazeley the forecasted rain started with a vengeance, so we pulled over and had lunch waiting for it to ease. We left it for an hour, but, with no sign of it slowing, decided to press on to get clear of Tamworth. 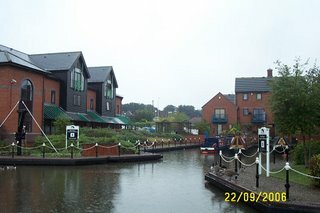 Passed Fazeley junction and the attractive Peels Wharf in the rain, so are now, for a while on the Birmingham and Fazeley Canal. Had enough by Hopwas, so stopped on the visitor moorings in the village. Bit too near 2 pubs for our liking, though. Beautiful morning, warm with blue skies. I’d saved the Atherstone flight as a birthday present! She has 6 cards, but there are more waiting at Dad's for when we get there. About an hours run to Atherstone top lock, a very attractive flight, but with the steel replacement top gates are very heavy, much worse than the original wooden ones. It took about 3 hours to pass through the 11 locks, some in our favour, some against. 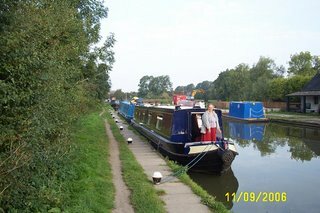 Met NB "Ebenezer" at No 6, last seen at Kilby Bridge on the Leicester Line about a fortnight ago. 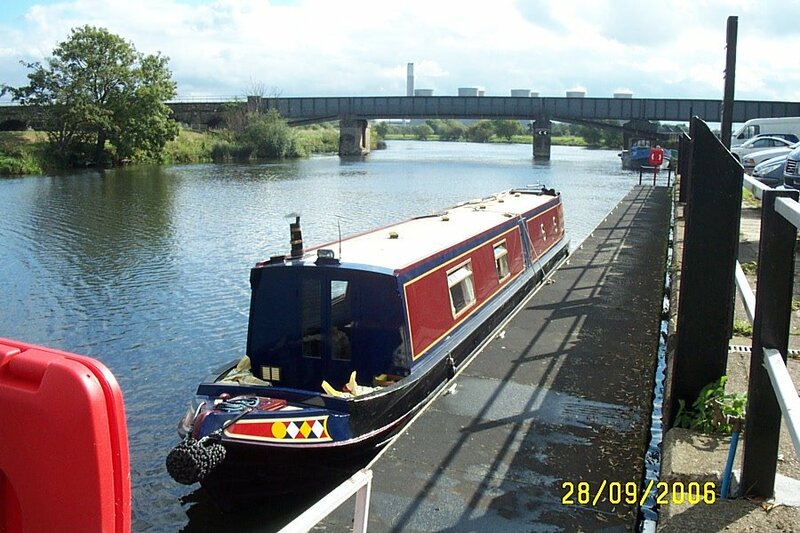 She is a Steve Hawkins boat, with fine lines, built at his yard in Tamworth. Filled up water at Bradley Green bridge and moored about ¼ mile further on. Moved off about 09:50. 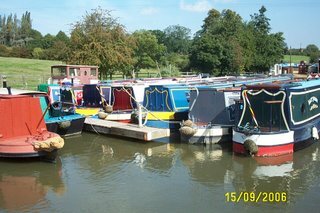 Lots of moored boats around the junction. Through the lock and round the 180° bend onto the Coventry Canal. 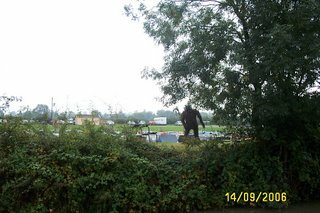 Around the western edge of Bedworth, but little of the town to be seen, only evidence of it’s existence; today has taken the shopping trolley record, 7 in all. They come in pairs, here…..
Cruised past Marston Junction (Ashby Canal). Another we will save for some other time. Around Nuneaton, from the canal this is "Allotmentland", with about 2 miles of continuous weekend endeavour. Still, much better than Loughborough’s "Factoryland". 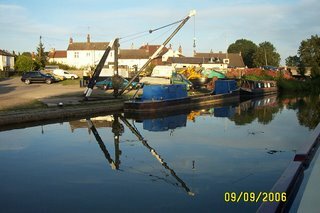 Finished the day on good moorings at BW’s Hartshill yard. As arranged we stopped at Rose Narrowboats in the morning to have the 240v system checked out. 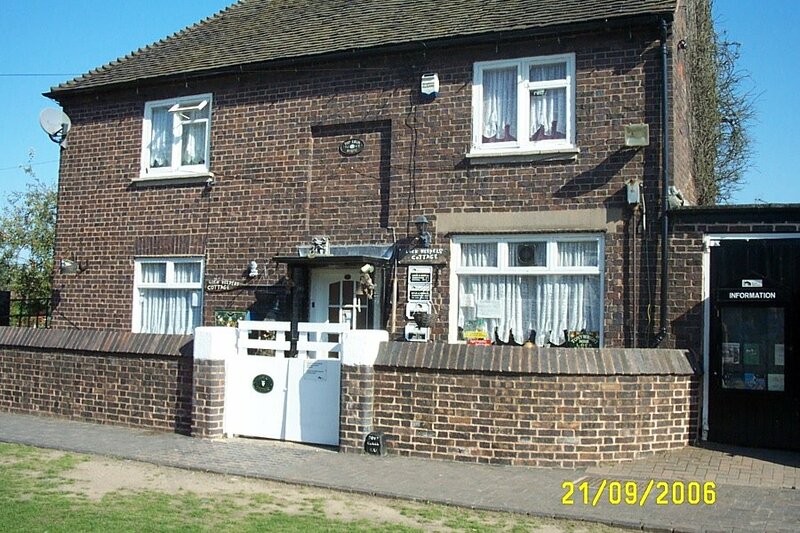 Colin was very helpful and informative, advised that we should be running a minimum 2.0kva inverter, with the wiring upgraded to suit. He suggested we should look at Mastervolt or Victron as these are very reliable units. He did point out that the Studer fitted is also well thought of, just too low capacity for this installation. After changing the fuse holder and fuse, we were on our way again. Many thanks to Colin and Roger. 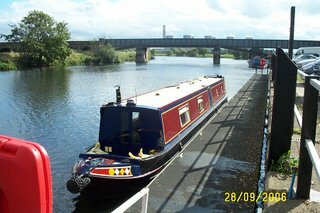 I spoke to Mike at Orchard, and we have arranged to take the boat back up to Northwich to have the necessary upgrade work carried out. This will be after the cratch frame and cover are fitted at Redhill, the first week in October. Heading towards Hawkesbury at our usual sedate pace, we were overtaken by an idiot in a hurry who, with the help of a stiff cross wind, ran us aground on the offside. Took us 5 minutes to get moving again. Stopped for the night about 1 mile short of Hawkesbury. 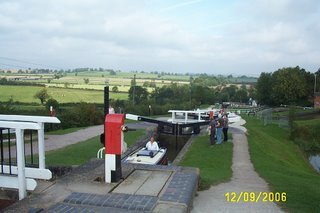 Off at about 10:30 down through the 3 Hillmorton Locks. These are paired and numbered 2 & 3, 4 & 5, and 6 & 7, from bottom to top. I wonder what happened to lock 1? Stopped at lunchtime at Bridge 58 in Rugby to visit Tesco’s, mainly for dog food.We decided to do a wash on during the afternoon run, so started the machine. However, it stopped part way through it’s cycle. On investigation, there was no power coming from the inverter. A 200A fuse in the battery feed had failed, and also showed signs of heat damage.I rang Mike at Orchard to advise him of the situation, and also to tell him that the inverter fitted was only rated at 1.3KVA, and not 1.8 as assumed. As the washer is rated at 1300w average, this is obviously under specified. 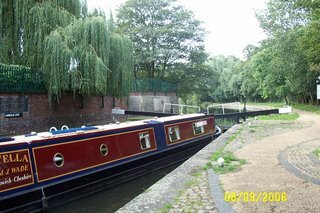 I then rang Rose Narrowboats at Stretton Stop, who were the nearest boatyard, and arranged to call in the following morning. 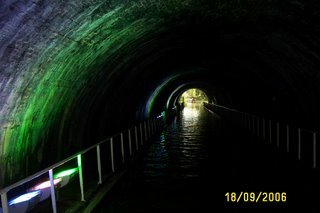 Continued on to our overnight at All Oaks Wood, a very popular spot for mooring, through Newbold Tunnel with it's fancy lighting scheme. It makes you wonder if this would still have gone ahead if BW knew they were going to get the funding cuts recently announced. Off at 10:00 after my early morning run. Down to Norton Junction and turned right (West) towards Braunston on the Grand Union Main Line. We are as far South as we are going this time. 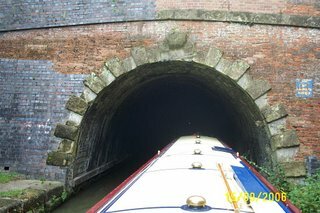 I’d heard that Braunston Tunnel was narrow, although wide enough for 2 boats to pass. 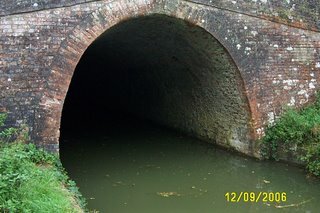 This would be the case if boats coming the other way kept to their side of the tunnel! 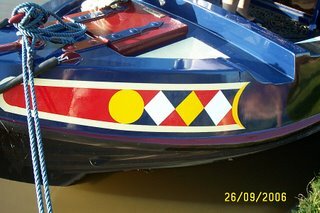 We had a glancing collision with one boat, even though I was close enough to my side to take the paint off the right hand top bend. 2042 yards of nail biting and we were out into the sunshine again. 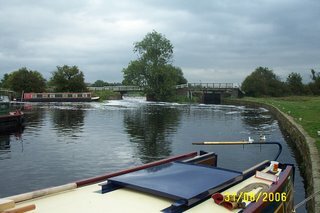 We had passed 8 boats coming the other way, more than on a whole day’s cruising on the Soar! 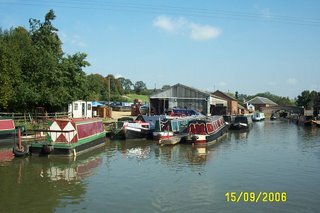 Shared Braunston Locks 6 – 3, then 1 and 2 on our own as our companions stopped for a pint at the Admiral Nelson. 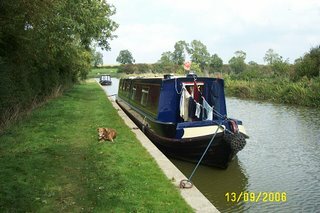 Very busy with boats through Braunston, but we managed to secure a 48 hour mooring near Bridge 1, so will stay here till Sunday afternoon. 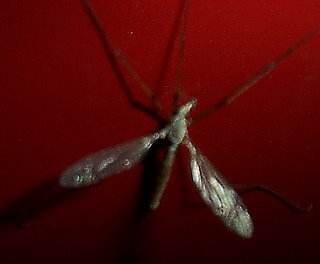 Had the great "Daddy Long Legs" invasion last night! 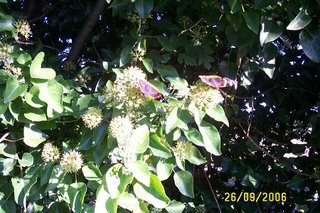 They were coming in through any nook and cranny, heading for the light. 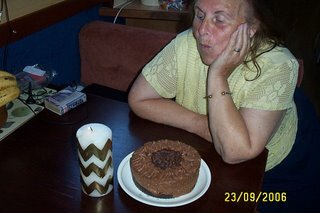 We finally lit candles instead of having the electric light on, then they fried themselves! Don’t know what is the cause this year, or maybe we’ve never been so aware of them before, but there seem to be a lot more than normal. Just up from where we moored was another narrowboat with the name "Duck Duck, Charlie Brown" I’ve seen some obscure names, but this is about the best. Had the chance to ask the owner later, turns out that they are his 2 daughter’s nicknames. 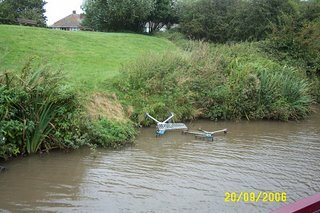 Moved off at 10:00, filled up with water and emptied rubbish at Yelvertoft, but there was no place to moor, so we moved down to Crick. They must get up to some arcane rituals down here, saw this Whicker Man at Crick Marina. Did a small shop at the PO/ General stores and it started to rain as we got back to the boat. This developed into a full-blown thunderstorm, so we held on till about 14:30 before setting off again. Through Crick Tunnel and arrived at the Watford Flight at about 15:30 and had a noisy hour’s wait under the M1 bridge till we could start down. Took about 40 minutes to clear all 7 locks. Ran for another 2 miles and stopped opposite Weltonfield Marina at about 17:45. Set off about 10:00 with the day brightening. 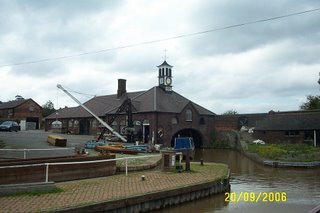 Emptied the loo at Kilworth Wharf after going through Husbands Bosworth Tunnel, then made a decision not to go to have a look at Welford at this time. Stopped for lunch just after the junction, put the washing out to dry. Very pretty area, but also pretty boring after a while. Only saw about 6 boats all day, and had to meet 2 of those on the shallowest, narrowest section. Stopped for the night between bridges 25 and 24, after a high (for us) mileage day. A local farmer had a long day, he was ploughing a field opposite our mooring when we arrived, and finished about 21:30. Started out to do a 4½ mile training run and got lost (again). Finished up doing only 3¾. A grey morning after overnight rain, but brightening. Through Saddington Tunnel, saw the bat boxes but no bats that the tunnel is known for. Filled with diesel at Debdale wharf, dipped the tank before hand so can now calculate the size of the tank and average consumption. I reckon we have 160 Lts capacity, and are running at just under 1 Lt/hr, combined for the engine and heating. Bought a waterways map for sister-in-law Doris at Foxton during our 25 minute wait to start. Once away took just under an hour with no mishaps to clear the complete flight. Longer queue waiting to come down, mostly Canaltime boats. 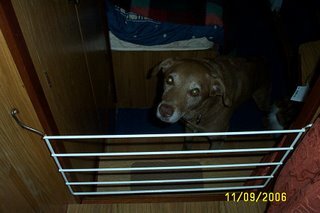 Had a 45 minute breather at the top to give Bruno a chance to stretch his legs after being kept inside all the way up. Outstanding views from the top. Margaret is now feeling far more confident now she has overcome this hurdle. Stopped at 15:00 at a very quiet spot near Lubbenham Lodge Bridge, No 58, with views across the valley. Spent an hour rewiring the satellite dish cable through the normal aerial connector so the cable doesn’t have to come through a window. Saturday afternoon and Sunday were scorching, although Sunday started very misty. Went for a 6 mile run first thing, got lost and ended up doing 8! Caught up with washing and polishing, made a gate to keep Bruno inside when we are going through locks where there is a risk from traffic. He watched me from start to finish, I don’t think he’s very impressed! The lazy day was followed by what should have been a heavy lock day, 12 between Kilby and the long pound to Foxton (although no paddle locks, now). But we were lucky enough to team up with a young couple out for a week, so shared the work through all 12. This made the run a lot quicker than expected, so we arrived at our mooring at about 13:00. Pleasant spot, just past Ross Bridge no 74 with good TV and Satellite reception. A short walk into Fleckney gives you a Co-op, chemist and PO. Had a swan come to visit while I was washing up after dinner. 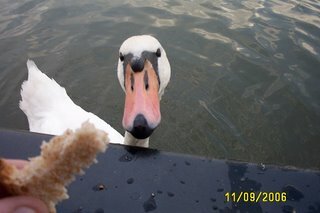 So tame he’d take bread from your hand. Another beautiful day, with a gentle breeze to just take the edge off the heat. Left Gee’s Lock at about 09:30. Although probably not the best spot to stop over, we’ve not been disturbed through the night. Steady run through the 6 locks to Kilby Bridge, but the locks on the paddles (if they’ve not been cut off by the locals!) are a nuisance. 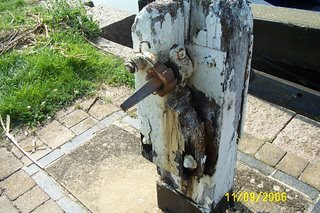 These were fitted by BW to prevent the local yobs from draining the pounds, but you have to undo and re-lock at least 4, sometimes 6 if the lock is against you. Still, sign of the times, I suppose. This, combined with the weight of the gates, makes this section hard work. Arrived at Kilby Bridge BW maintenance yard about 14:00, watered and emptied the loo and rubbish, and decided to stop here over Sunday for some R&R. There is a small general store about 20 minutes walk away, so we can stock up on essentials. A cool clear night led to a beautiful, crisp morning. Went for a 6 mile run around the country park, saw foxes, woke the ducks, and disturbed the geese. Set off from Birstall at about 09:15 heading South to Leicester. The route through the city was a surprise, with (generally) well tended towpaths and a lot of new riverside development. I remember when I was in further education in Leicester, and did a photographic project on delapidation and decay beside the canal. I’d be struggling to repeat that now! Pity I haven’t still got those prints. 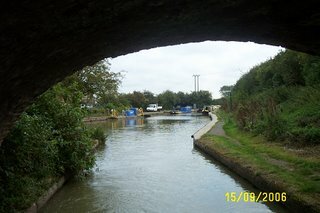 The locks here are very heavy, we were lucky to hook up with another boat and shared the work through most of today’s. Coming out of the built up area, some sections are very narrow and windy, very river-like in nature, with overgrown banks and no view of the surrounding countryside. 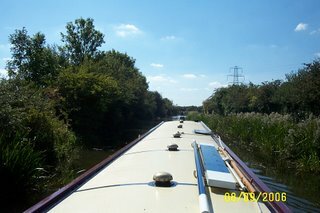 Glad to be out of the city though, overnighting just past Gee’s Lock between Aylestone and Wigston. The original plan was to go down to Market Harborough and spend a couple of days there before slowly retracing our steps to make our appointment at Redhill at the end of the month. Rather than do this, we’ve decided to keep going South, and pick up the Grand Union Main Line at Norton Junction. 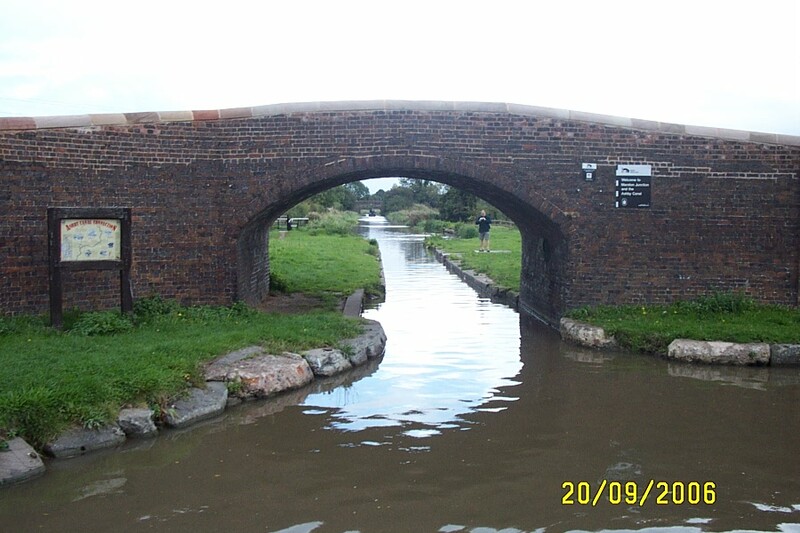 Thence to Braunston, up the North Oxford and Coventry canals, and back onto the Trent and Mersey to take us back to the River Soar junction. We should be able to do this in about 15 days at 4 to 5 hours a day, and avoiding weekends if possible. 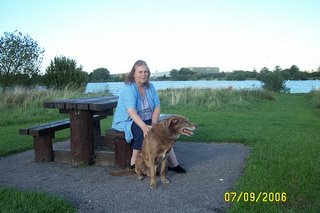 Having had a quick look at Watermead Country Park when I took Bruno for a walk last night, we decided it deserved a better look. So when Dave from BKPS rang, we arranged for the engine service today, and planned to stay here for another night. Moved back down through the lock to improve access from the road, and Dave arrived at 10:00. While he was busy, we had another go at setting up the satellite TV, now that we know the kit is operational. Set it up, lined up and got a signal straight away! I guess it’s an acquired skill. When Dave had finished we took the boat a couple of hundred yards downstream so he could listen to a transmission whine I was uncomfortable with. He reassured me that it was normal, coming from the gearbox. He left at around 13:30, job done and with some helpful hints for me. When we moored up again I had to realign the dish, which I did with no problem. Practice makes perfect. 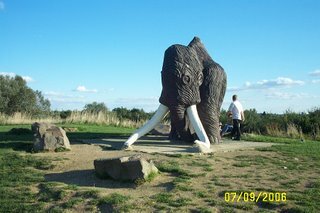 Then took a walk around the country park, a beautiful spot with a carved mammoth standing on a low hill. Apparently some fossilised remains were found here some time ago. As mentioned previously, I took the digibox to check it out first thing, and proved that it works. 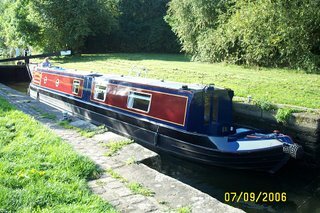 Then Reg from Boat Hoods Direct rang, wanting to come and bring the carpenter with him to measure up and discuss the cratch frame and cover. Dad and Ann wanted to come down to say cheerio but couldn’t make it until after 13:00, I needed to empty the loo, so all this conspired to stop us leaving till 15:00. We had decided to head South through Leicester and have a look at Market Harborough before we have to be back at Redhill for the end of the month. 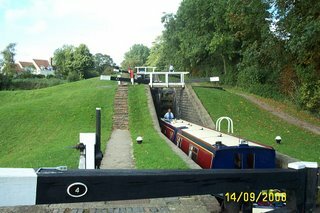 We had an easy run through Sileby, Cossington and Thurmaston locks, intending to stop for the night below Birstall lock. 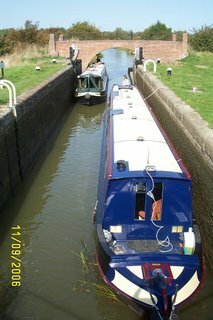 The mooring was full, so we pushed on through the lock to look for a spot before entering Leicester. BIG mistake… finished up turning round above Loughborough Rd Bridge to head back to Birstall and a night on the end of the lock landing at the top of the lock. Bob Knowles rang, and told us the engine service could be done Thursday or Friday to suit us. He would ring Thursday AM to confirm. 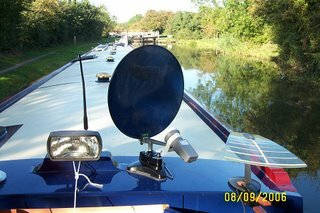 I’d ordered a Kerstan satellite dish which hadn’t yet arrived, but we’d only booked the mooring at Junction Boatyard till Thursday. Anyway, we’d been unable to reach the power connection for shore power since our day trip on Tuesday, so there was no advantage in staying. But we had to stay local as the package was going to Dad’s house in Sileby, so moved downstream to Sileby Mill. A beautiful spot, and reasonably handy for shopping in Sileby village. Sileby Lock - Note extension on tiller bar, thanks Andy. Bought an anchor and associated paraphanalia from Sileby Mill Boatyard, so we’re OK for the Trent. 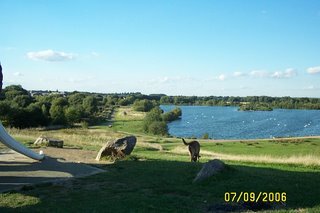 Found that we can last for about 4 days on our batteries, so long as we don’t use the power hungry washing machine or vacuum cleaner, but by Sunday needed to empty the loo and fill up with water, so had a gentle run up to Barrow upon Soar to the BW service point. The trouble was, 3½ hours running at slow speed didn’t put an awful lot back into the batteries. 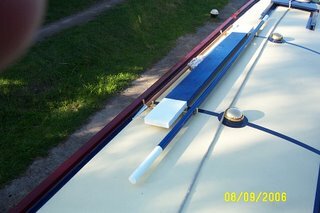 I took advantage of our stay to get the pole and plank painted, so we don’t look so much like virgin boaters! The dish arrived on Monday PM, so I went up and collected it. I couldn’t wait to try it, as we had been frustrated by not being able to receive a signal on the old one we had brought with us. Connected up, but still no signal! After an hour of trying, got almost to the point of throwing the dish and digibox into the cut! After calming down, decided I needed to prove that the box was working, so arranged to take it to my brother’s house on Wednesday to hook it up to his Sky dish. This proved the box works, so back to square one.